Free Video to iPhone Converter is a practical application capable of converting nearly any kind of video to the correct format for the iPhone by Apple. Thus, it transforms the videos to MP4 codified with the high quality codec H.264. The way Free Video to iPhone Converter is very intuitive. Once the application is launched, you have to load the file that you want to convert by clicking on the "Browse" button, after selecting the video, you have to write the output files name and select the output folder where it will be stored. After this, you have to select one of the predefined codification profiles that are provided with the program. - Conversion of video to high quality MP4. 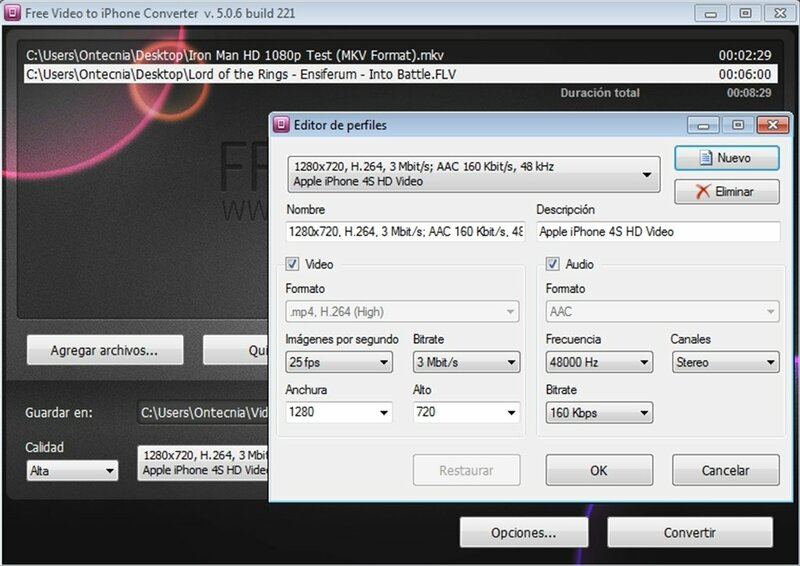 - Possibility to only convert certain fragments of a video. - Three codification profiles classified according to quality: "High", "Standard" and "Economy". - Support for the following input video formats: AVI, MPG, MPEG, MPE, WMV, ASF, MOV, QT, 3GP, 3G2, FLV and SWF.